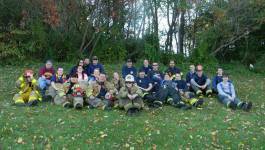 Boyertown Area Fire & Rescue is a unique Fire and Rescue Company in that we do not have a social hall or other type facility that supports our firefighting operation and our Board of Directors is not comprised of firefighters; the Board is made up of local business people, members of the Legacy Fire Companies and Municipal members. We are supported by the Legacy Fire Companies as well as each Municipality that we serve. The Company also does fundraising and accepts donations to help support the fire & rescue operations. The Company has approximately 85 to 95 members at any given time with approximately 60 of those being active firefighters. We currently have no paid staff, using an all volunteer staff to handle fire & rescue calls every hour of every day of the year. B.A.F. & R. handles all types of fire calls, alarms both fire & carbon monoxide; Rescues of all types including Vehicle, structure, high angle, confined space, trench and water as well as Haz Mat and other service type calls.